RFID Tags that Beat the Heat! Need to track assets or machines exposed to extreme heat, high pressure or corrosive chemicals? Omni-ID, and only Omni-ID, has the perfect tag for you. Many industries process assets, products or materials at elevated temperatures using carriers or containers for transportation purposes. Frequently being able to reliably and uniquely identify and track the asset or container is highly advantageous, generating efficiency and compliance benefits. 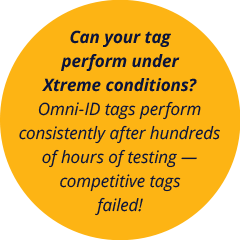 Omni-ID found the marketplace was in great need of a tag that could survive repeated exposures in high temperature settings such as automotive paint booths, medical autoclave sterilization and manufacturing operations. The only available RFID tags on the market were, and continue to be, too large and bulky for most use cases, too expensive for large deployments and generally unreliable with an inconsistent resistance to high heat. With the Fit 210, 220, 400, Exo 400 and IQ 800P HT, Omni-ID provides a complete family of RFID tags designed specifically for high temperature environments reaching up to 235°C. These products address the critical needs of customers with their combination of a unique form factor, read range up to 8m and high temperature survivability – all at a very competitive price point. High temperature labels are an ideal solution for consistency and reliability during the rigors of auto manufacturing, specifically through paint shops. The label is used to identify and track each vehicle through the assembly process with the additional capability of surviving temperatures to 230°C. As a single use label, the Omni-ID IQ 400P HT or the IQ 800P HT provide customers the benefit of a low cost option while maintaining the complete tag history from welding to painting and on to the finished vehicle. Need a specific size or a custom location for your attachment, Omni-ID can do that and create a specialized version to meet all your requirements. Small very narrow RFID tag capable of surviving temperatures to 225°C, designed to meet high impact and vibration requirements. 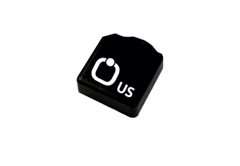 Small form factor tag in a rugged encapsulation capable of surviving high temperatures to 235°C. 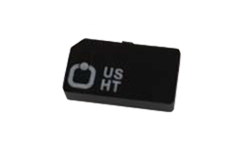 Extremely small form factor high temperature RFID tag capable of surviving temperatures to 235 °C. Used on small metal tools, IT assets & Healthcare instruments. Single use synthetic hang tag capable of surviving high temperatures to 230°C optimized in applications where the inlay of the tag hangs away from the metallic asset. Small form factor, High Temperature tag capable of surviving cycling applications with temperatures to 235°C. Don’t sacrifice performance for size. High temperature synthetic RFID hang tag suited for single use applications, capable of surviving temperatures to 230°C. Optimized for thermal barcode printers, the label performs at its best in applications where the inlay hangs away from the metallic asset. The Fit family of tags satisfies all of the above and more. 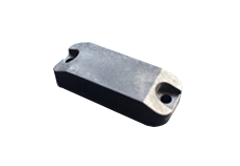 These tags are ideal for cycling operations where temperatures are repeatedly rising from ambient to upwards of 235°C and cooling back down. Our engineers conducted extensive testing where the Fit tags successfully survived hundreds of cycles from -20°C to +235°C (see before and after images below). Our thorough testing and validation program guarantees the reliability of these tags. Machine tooling – Tags are set into recesses in manufacturing tools in order to measure and track maintenance schedules ensuring production quality and line up time. Medical implants and tools – Sterilization is a critical process with elevated temperatures of short duration and a critical need to track containers and assets. Sterilization trays often require 150-170 degrees, but when quicker sterilization processes are required a much high temperature can move the process through in a matter of minutes. Food industry – Sterilization of reusable containers where temperatures and exposure periods reach 160°C for upwards of 30 minutes. Automotive paint booths – Parts carriers are being cycled multiple times each day at typical temperatures of 210°C and exposure times of 20 minutes. Many bumpers and automotive parts are now built by hydroforming processes requiring very high temperatures for these molding applications that exceed 180°C. Energy sector – There are many application cases where assets and carriers are exposed to high temperatures with exploration drilling frequently experiencing excursions up to 215°C. With four size variations, all in a small form factor, and read ranges approaching 4 meters these are the most versatile and most reliable high temperature tags on the market. 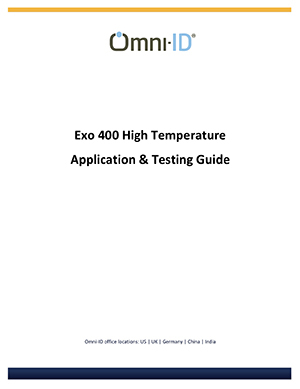 The Exo 400 HT tag has been subjected to extreme testing to ensure performance across a much higher temperature than standard tags. This document outlines the standard and specific testing performed to validate this tag. 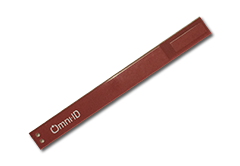 Omni- ID announces New High Temperature Tags. 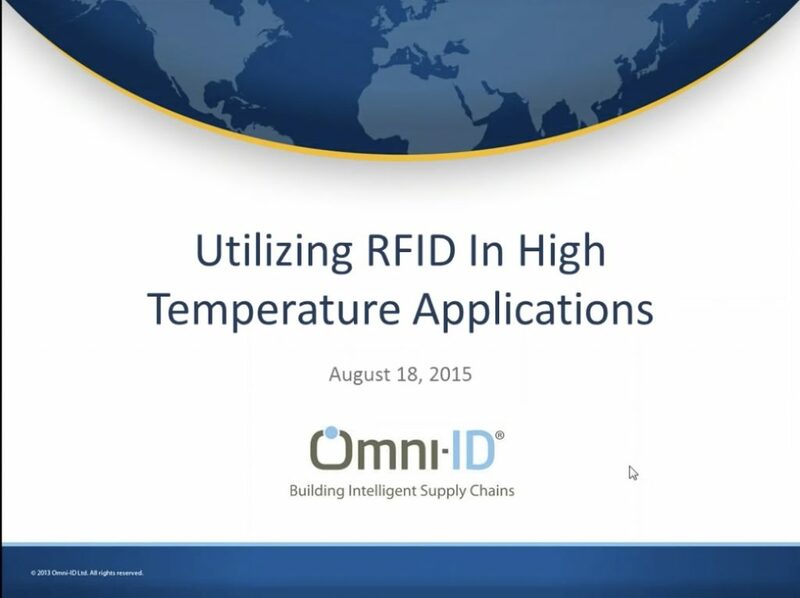 Let Omni-ID help you begin a checklist of information to define the key requirements necessary for an effective deployment of RFID in high temperature applications. Contact us to learn how Omni-ID's RFID solutions will give you greater performance, advanced technology and help save you money. Please fill our short form and one of our representatives will contact you shortly.